I’m going to kick off this lovely list of recipes by leading an internet round of applause for Janice, who thwarted the curse of too-warm hands and went ahead and baked with pastry anyway. “I don’t do pies,” Janice once told me. She and pastry are not friends. After many failed attempts at pies and other treats, she informed the other women in her family of her frustration. There was much head shaking and several despairing “tsk tsks,” and Janice was informed that alas, she was born with warm hands and that pastry would forever mock her. But behold, she did it anyways! And I think we can all agree that her spiced nut palmiers were a rousing success. Perhaps the curse of the PASTRY OF DOOM has been broken! Lightly butter two large baking sheets, preferably non-stick. In a food processor, process the nuts, sugar and cinnamon until finely ground. Transfer half the mixture to a small bowl. Sprinkle the work surface and pastry with caster sugar and roll out the pastry to a 50 x 20 cm / 20 x 8 inch rectangle about 3mm/1/8 inch thick, sprinkling with more sugar as necessary (Sophia’s note – of course I read that as “more sugar than necessary). Brush the pastry lightly with beaten egg, sprinkle evenly with the nut mixture in the bowl. Fold in the long edges of the pastry to meet in the centre and flatten with the rolling pin. Brush with egg and sprinkle with most of the remaining nut mixture. Fold in the edges again to meet in the centre, brush with egg and sprinkle with the remaining nut mixture. Fold one side of the pastry over the other. Using a sharp knife, cut the pastry crossways into 8mm/ 3/8 in thick slices and place the pieces cut-side down about 2.5 cm/ 1 inch apart on the prepared baking sheets. Spread apart the pastry edges to form a wedge shape. Chill the palmiers in the fridge for at least 15-20 minutes. Preheat the oven to 220 C/425 F.
Bake the palmiers in the preheated oven for about 8-10 minutes until golden, carefully turning them over halfway through the cooking time. Watch the palmiers carefully as the sugar can easily scorch. Transfer them to a wire rack to cool. Store in an airtight container. 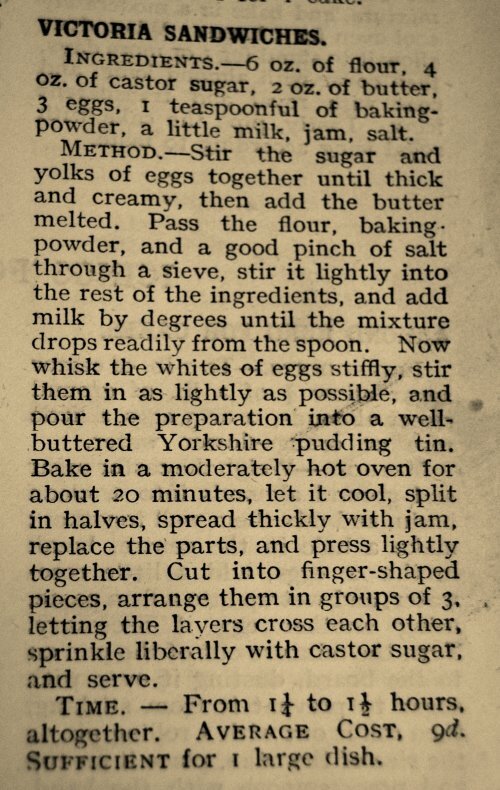 I thought it would be fun just to post a picture of the recipe directly from the Mrs. Beeton book (click to make it bigger). Kim served the Victoria sandwich with rhubarb curd, which was positively dreamy. Who cares if it turns out a little runny, because then you have a perfect excuse to drown your cake in the extra. Nom! I have never attempted a roulade. I somehow manage to use all of my kitchen and have been known to overlap into the living room when I’m baking. I imagine requiring an actual island instead of a kitchen island if I were to try to do this. 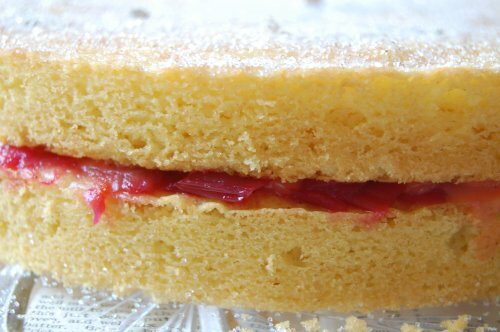 But if someone else wants to go ahead and create this lightly spiced, moist and lovely cake, I fully support this endeavour. While the cake is still hot, lay a clean, unscented, lint-free kitchen towel over it. If the towel is long, extend one end about 1-1/2 inches beyond a short side of the cake and don’t worry about the other end. Invert a large rack or cutting board over the towel. Holding both the baking sheet and the rack with protected hands, invert the cake. Remove the baking sheet and parchment. Using both hands and starting from the short end with the shortest towel overhang, roll the cake and the towel up together. Let cool for 30 minutes. Carefully unroll the cake; it should look wavy and both ends should curl. (It’s OK if there are some small cracks.) Let cool completely, 10 to 15 minutes. These were adorable (and extremely tasty) and would make amazing gifts or place setting treats. 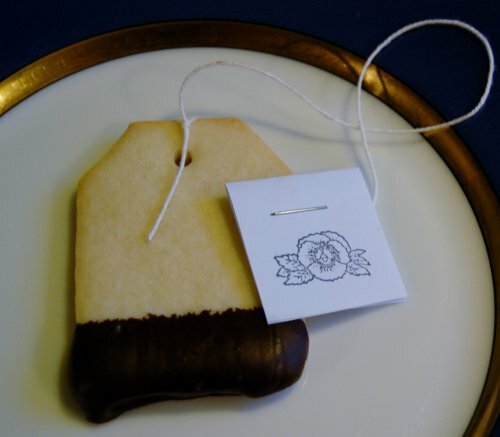 From Jean: The fiddely part of this cookie is making the string tag. The string is crochet cotton. Mix first 5 ingredients. Shape into a disk and refrigerate 1 hour. Roll dough out about ½” thick. Cut shapes (make a template of a teabag). Poke a hole in the top using a straw. Bake 5-10 minutes. Let cool. Melt chocolate, dip bottom of eat “tea bag.” Lay on wax paper to set. Thread through the hole, attach the “tag” at other end of string. 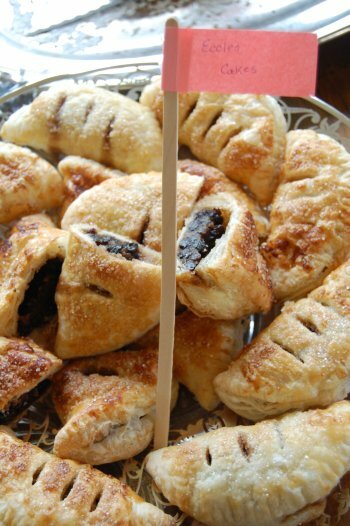 Because crafting tea bag cookies was not enough, Jean made Eccles Cakes as well. These are so perfect for tea time, and would be great for a picnic as well. From Jean: Cut brown sugar down to ½ cup if you wish. Preheat oven to 400 C. Line baking sheet with wax paper. In a small saucepan, melt butter. Stir in currants, allspice, nutmeg and cinnamon. Mix thoroughly. Remove from heat. Roll pastry out about ¼” thickness. Cut out rounds, using about 3” circle. Divide currant mixture between circles; moisten the edges with milk; fold over & pinch edges using a fork. Turn pastries upside down, gently roll out to make a flatter/wider pasty. Do Not Break The Dough. Brush each cake with beaten egg. Sprink with sugar (I used organic raw sugar). Make 3 parallel cuts across the top of each cake. Bake 15-20 minutes, remove and sprinkle with more sugar. To make these cookies, Jane used an electric food gun that she had picked up at a garage sale “many, many moons ago.” Check out the Proctor-Silex Electric Food Gun “Super Shooter” circa 1970. I love it – it makes me imagine Jane is some kind of culinary detective, out to solve kitchen mysteries like The Case of the Collapsed Soufflé, or The Dangerous Dame Tart Shell and the Crime of the Disappearing Custard. From Jane: I am sure you could produce a nicely shaped cookie and achieve the same result using a pastry bag and large decorating tip; Wilton brand has a multitude of choices. Cream butter and sugar until fluffy. Add flour and cornstarch, whip until fluffy. Drop by teaspoon on cookie sheet or use an “electric food gun”. Bake at 300 until golden brown, approx 10-13 minutes for 3″ cookie. Makes 7 dozen plus cookies dependant on size. Gerri served these with homemade cherry jam and Devon Cream, which I have now learned that you can pick up at Nester’s here in Summerland. I’ve always preferred cream over butter on scones. Combine with jam and add a lovely cup of Earl Grey, and I’ll be in my happy place until all the crumbs are gone. Preheat the oven to 360 C. Sift the flour & baking powder in a large bowl, stir in sugar and salt. Cut the butter into the flour until it resembles fine breadcrumbs. Mix together the milk and lemon juice – the mixture will curdle slightly. Add the beaten egg and pour into the flour mixture. Mix gently just until the dough forms. Do not keep mixing. 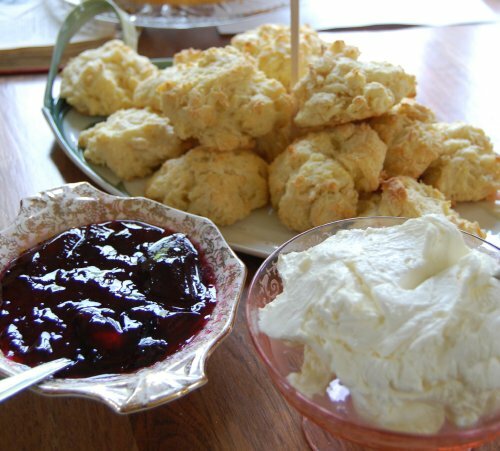 Pick up dough the size you wish your scones to be and place on a parchment lined pan. The less fussing the lighter they will taste. Bake approx 15 – 20 minutes depending on size. 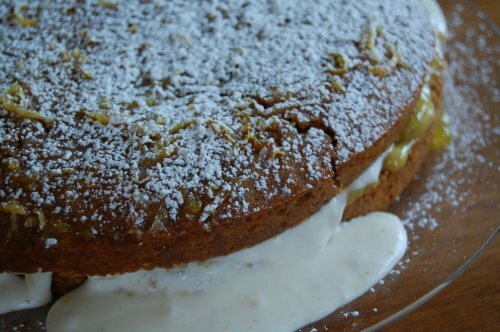 This cake is rich and warming and very Moorish. Served with extra cream to compliment the hit of ginger, it’s very addictive. The recipe is from the UK. From Dorthea: The lemon curd was tricky because I had no idea what a stem ginger ball was. Instead I used candied ginger and found a jar of ginger marmalade to use instead of the stem ginger syrup. I think those worked well as substitutes. So for the lemon curd mixture, I diced the candied ginger, about 2-3 tablespoons, and then combined it with the lemon curd in the blender again. Actually I have an old Braun coffee grinder that I use for spices, etc., and I used it to dice the candied ginger, and to mix as much of the lemon curd as would fit in the coffee grinder, and then I mixed the rest of the curd (about 1/2 – 2/3 cup altogether). The cream icing filling was the main problem because I clearly didn’t use a firm enough cream. The recipe calls for cream cheese, heavy cream, ginger syrup, and icing sugar. 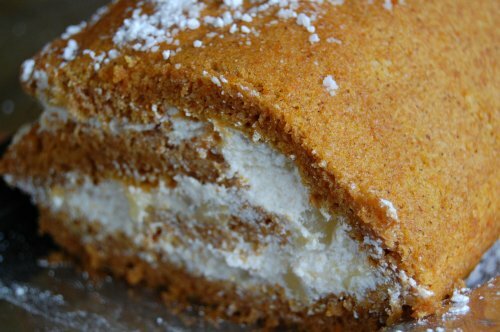 I used whipped cream, cream cheese, ginger marmalade, and icing sugar. The whipped cream didn’t stay firm, which is why it was oozing out of the middle of the cake. While some is supposed to flow gracefully down the side of the cake, this just flowed. I should have used something firmer- perhaps all cream cheese, or even sour cream, or some of Gerri’s double cream! Choux pastry is another thing I haven’t yet tried, however Laura has convinced me that it is easier than I have imagined it to be, so I’m officially going to give it a go. 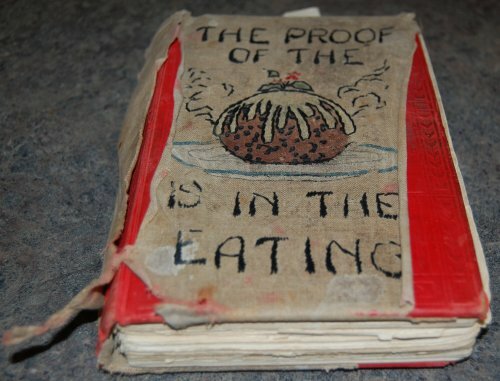 I love some of the images or notes I get from our bakers, with recipes dug up from obscure books or magazines. 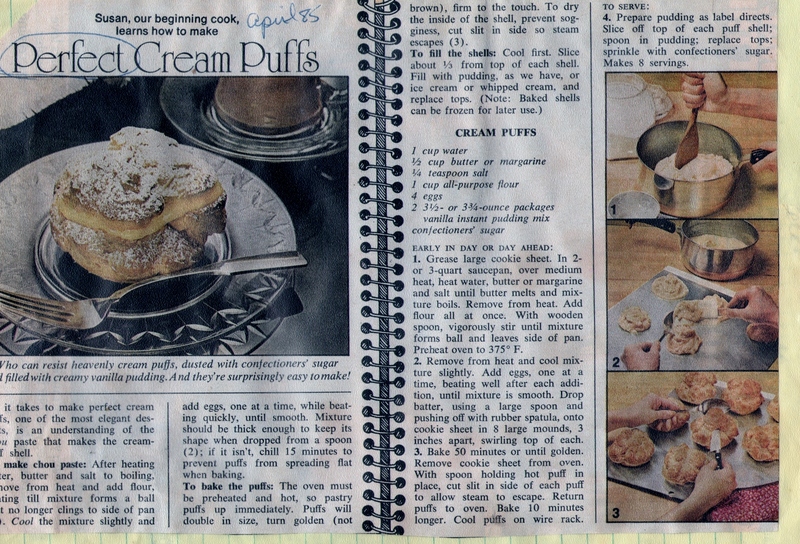 Here is the choux pastry recipe – notice the note “April 85.” (click to embiggen) Nearly 30 years and still churning out perfect Cream Puffs! In a large bowl, beat egg with flour, sugar, instant coffee, hazelnuts and cornstarch until well blended. In a large saucepan over medium-high heat, add milk and bring almost to a boil. Remove from heat and slowly whisky the hot milk into the egg mixture. Return all the ingredients to the saucepan, cook for about 5 minutes, stirring constantly until thickened and comes to a boil. Remove from the heat. Add vanilla extract and hot water to the thickened mixture, stirring to combine. Set aside to cool until firm. Fold in the whipped cream. Refrigerate until thick. 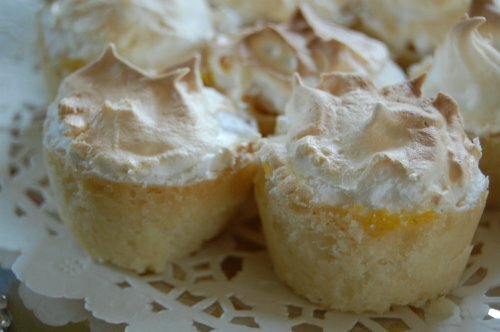 When ready to serve, horizontally slice the top of the cream puff to create two pieces, a top and a bottom. 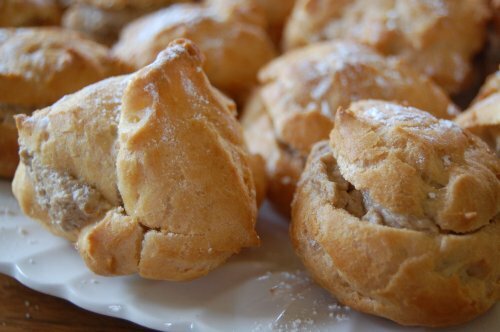 Fill each cream puff bottom with a spoonful of the filling. Close with the top section. Additions to this recipe may include flavoured extracts for liquors, cocoa, food colourings, or flavoured waters. In a large bowl, beat egg with flour, sugar and cornstarch until well blended. In a large saucepan over medium high heat, add milk and bring almost to a boil. Remove from heat and slowly mix the hot milk into the egg mixture. Return all the ingredients to the saucepan, cook for 5 minutes, stirring constantly, until thickened and comes to a boil. Remove from heat. Add vanilla extract, hot water and maple syrup to the thickened mixture, stirring to combine until dissolved. Set aside to cool until firm. Fold in the whipped cream. Refrigerate until thick. When ready to serve, prepare cream puffs as with hazelnut filling. I forgot to take a photo of these very pretty cookies! These are the very same shortbread biscuits that Ming to which treats her B&B when they arrive. It’s important to remember to use culinary lavender. Ming’s trick to never overdoing the lavender flavour is to add lavender to her sugar and give the flavour time to mingle, guaranteeing a subtle and aromatic cookie experience. In large mixing bowl, beat together the butter, powdered sugar, zest of 1 lemon, lavender, vanilla, and salt until the mixture looks like a coarse sand. Mix in the flour until the dough comes together. In a small bowl, mix together the remaining lemon zest and granulated sugar with your fingers until fragrant. Set aside. Lightly flour surface, and roll out shortbread to ¼ inch thick. Sprinkle on the lemon scented sugar and lightly press it into the shortbread with the rolling pin. Cut out shapes and transfer to a baking sheet. Bake for 8-10 minutes. 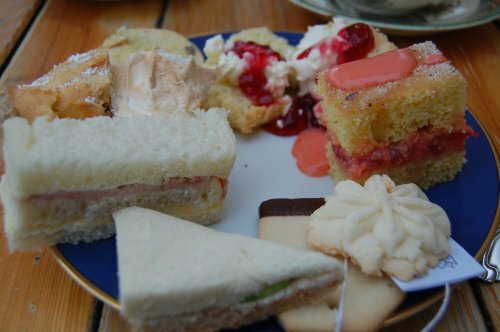 With so many sweets on offer, we all dove in to the plates of finger sandwiches provided by Vanora and Sandra. Vanora carved out quaint cucumber and tomato sandwiches into little triangles. And because finger sandwiches can dry out quickly, you don’t have to feel bad about eating a lot of them really quickly. 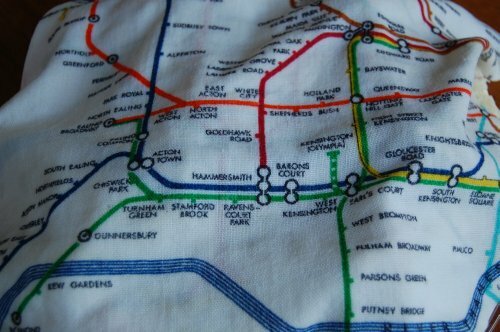 In between you can cover them with a London-inspired tea towel! Notes from Sandra: When you’re ordering bread ask for the white sandwich loaves sliced lengthwise and order a few days in advance . Two loaves will make enough for a full serving plate of sandwiches…I usually order 3 loaves – any leftovers are great for bread stuffing. 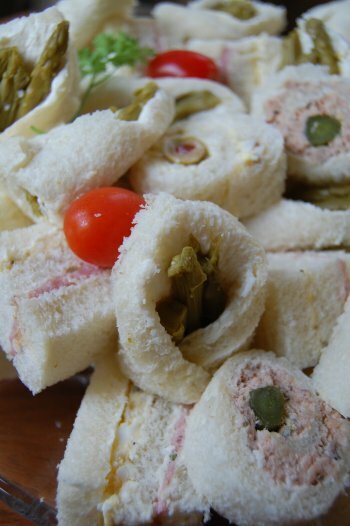 I usually make ham and egg ribbons, rolled egg with olives, rolled salmon with gherkins, and cream cheese and asparagus. Chopped gherkins or pickles, salt & pepper, and mayonnaise. For ribbons – leave crusts on – and butter three long slices with Cream cheese and butter mixture – and then use egg filling between 2 slices and then ham filling. Makes a 3 layered sandwich – cover these with a damp linen tea towel as you make them, as the bread drys out quickly. I usually make the night before — leave the large sandwich whole and then slice the next day. To slice – first remove all crusts and then slice into equal size fingers. Put in a container – back in the fridge – and keep covered with damp tea towel until ready to serve. 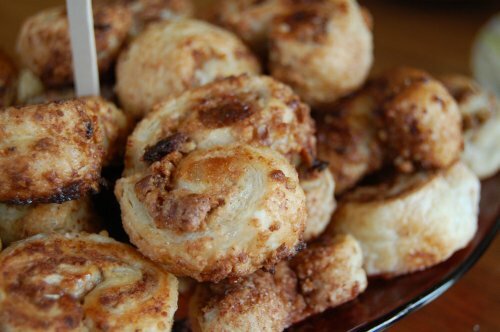 For rolled (Pinwheel) sandwiches – take a slice on bread – cut off the crusts at the short end – spread with cream cheese mixture and top with filling. Line up olives or gherkins at one short end and then roll – keep in the roll – overnight – with damp tea towel covering. Cut the next day. Cut end crusts off first and then cut each roll into 4 or 5 pinwheels. I usually fiddle with the olives so that you get the pimento showing on each sandwich (like a bullseye). Salmon with gherkins – do the same as above – when lining up gherkins – cut the end of both end of the pickles to give them a flat edge – it looks nicer when sandwiches are sliced. Asparagus – Add a bit more cream cheese to butter/cream cheese mixture – take long slice of bread – cut off all crusts and then cut long slice into squares – usually will make 4 squares – spread with cream cheese mixture – then lay two asparagus spears diagonally (and top to tail) then fold corner to corner and fasten with a toothpick – keep in fridge with covered with tea towel – slice in two when ready to serve. I usually make them the day before – slice them the next morning – and then they can keep all day in the fridge until ready to serve. Another UK recipe from BBC Goodfood, and not surprisingly the photo on the website looks much more lovely than how mine turned out. 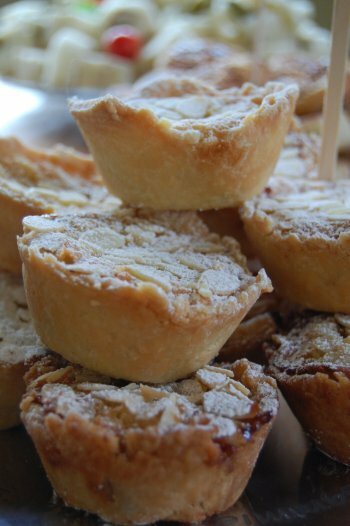 And finally we have Judith’s Mini Lemon Tarts! I don’t have the recipe but the secret is they are made with a shortbread case. 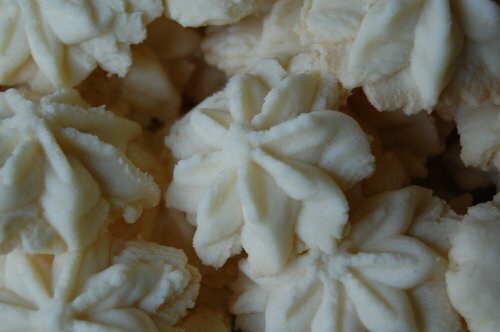 Judith reported that these are were more than a little difficult when it came to trying to extract them from the tin when they were finished. Apparently greasing is still a requirement even when dealing with something that is made of almost pure butter! Every month when our wee clan of bakers gathers to show off our creations, it’s so much more than just a case of “they came, they saw, they ate cake.” I think the best part is the exchange of stories and the way those stories weave through our time spent in the kitchen. 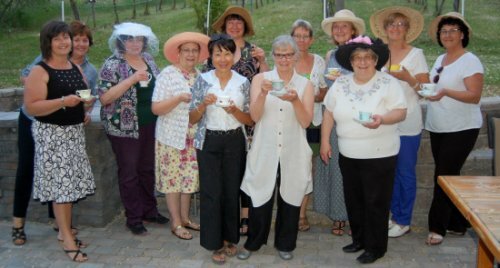 At this month’s High Tea extravaganza we brought our favourite tea cups and many of us wore rather grand hats. Many of the tea cups had been passed down from one generation to another, brought out every few years for special occasions. 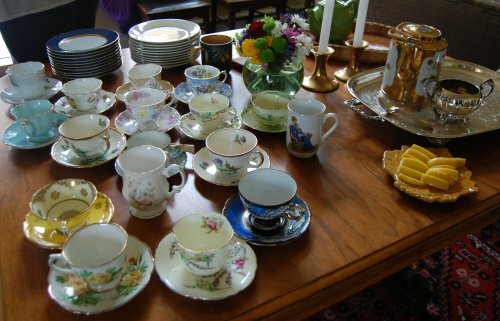 Kim was the hostess with the mostess, laying on a lovely tea service to compliment all our beautiful cups. Not only does she have one of the most amazing cookbook collections I have ever seen, but her Victoria Sandwich recipe was taken from Mrs. Beeton herself. 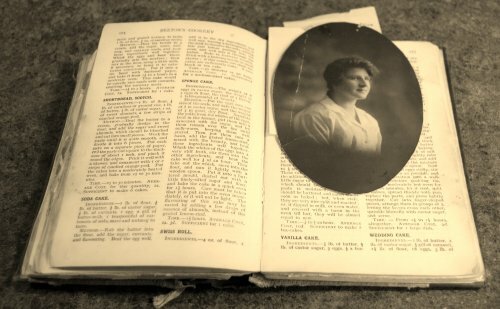 I think one of my favourite photos of the evening is the portrait Kim’s grandmother, “Queen Victoria Stansfield,” tucked inside the Beeton cookbook next to the Victoria Sandwich recipe. The treats! Oh, the treats. 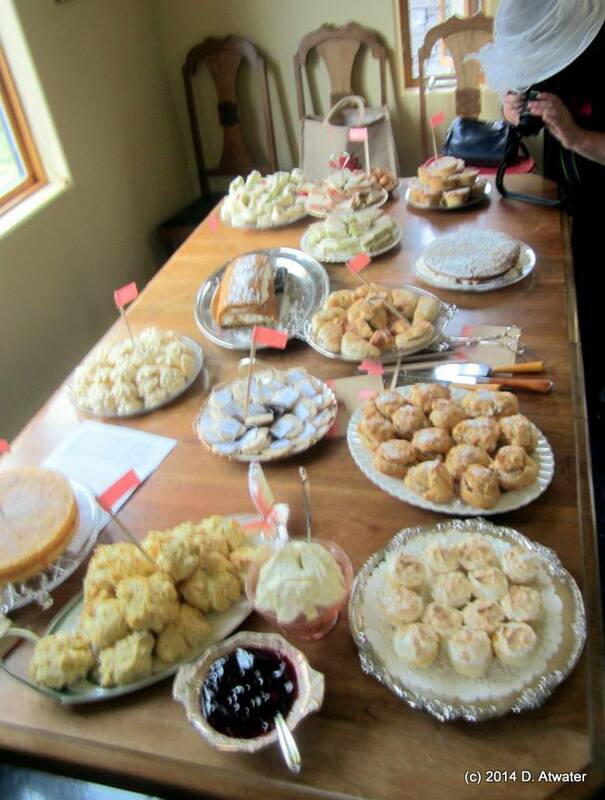 Fluffy scones, Eccles cakes, shortbread, sugar cookies, jelly roll, ginger and lemon cake, finger sandwiches (one plate was even draped with a London Underground tea towel), mini tarts, cream puffs, spiced palmiers, and even Devon cream and rhubarb curd! So enraptured was I with taking close-ups that I neglected to take a photo of the entire table, but luckily Dorthea did! You can see my giant hat in the corner as I snap away. 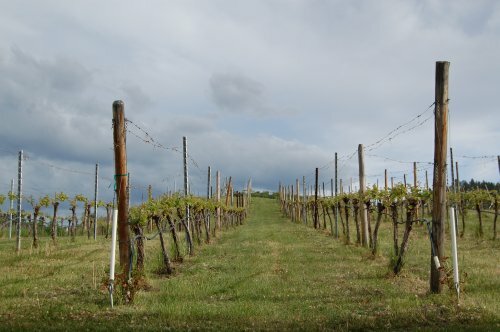 With a stunning view of Valentine Farm’s vineyards, we lounged, we laughed, we lingered and we plotted. Yes, Summerland Bakers have a secret plot. Can espionage be delicious? Yes, it can. More of this plot will be revealed at our upcoming gatherings. 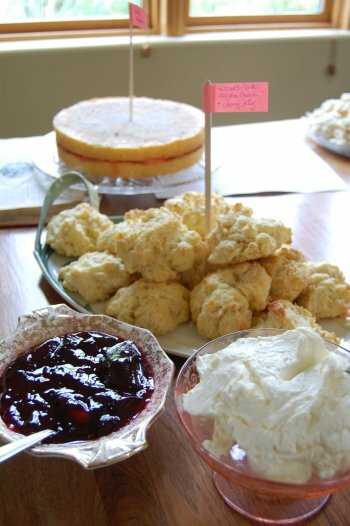 High Tea recipes will be posted next time! Please note our next event, Thursday, June 19 at Grape Escape Guest House. We’ll be meeting at 6pm so we have enough time for the grand tour before we get down to nibbling. Our theme: Appetizers! Email me to confirm your spot!